Last edited by deathwalker on October 21st, 2011, 2:49 pm, edited 1 time in total. ... is this based on a particular book/comic book or its a totally new story? The upcoming Spielberg movie is based on the "Secret of the Unicorn" collection. Collection sya in the sense na isa lang sya sa madaming stories compiled as books. Herge's Tintin comic stories were serialized in a Belgian newspaper between the decades of 30s up to the 80s. deathwalker wrote: The upcoming Spielberg movie is based on the "Secret of the Unicorn" collection. Collection sya in the sense na isa lang sya sa madaming stories compiled as books. Herge's Tintin comic stories were serialized in a Belgian newspaper between the decades of 30s up to the 80s. Wow galing, definitely watching this! Advanced screening has already started yesterday from selected cinemas across the metro. I'm going to watch it tonight or probably tomorrow. Unconfirmed reports suggest a trailer video of The Hobbit is around just before the screening of Tintin. Can't wait! I've watched this yesterday and can't recommend it enough. 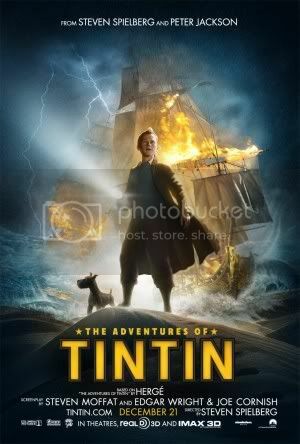 Even if you're not a Tintin fan, you will certainly enjoy this action-adventure movie. Its worth watching it in 3d. Its one of the few movies out there that is meant to be watched in 3d (the only other one I can think of is Avatar). I feel kasi in most so-called 3d movies that the 3d part comes as an afterthought that is meant by the producers to squeeze every possible dollar from gullible moviegoers. Last edited by jquin3 on December 1st, 2011, 6:57 pm, edited 1 time in total. The pace of the story is fast and it's like a big chase from beginning to end, reminiscent of Indiana Jones series. I cant exactly get what Capt Haddock is saying, he mumbles as he surely loves being drunk. The homage to Herge at the start is memorable though, that portrait that came up two-dimensional. I am not rooting for a sequel, what I want to see is that elusive Hobbit trailer that may be seen at the coming Sherlock Homes premiere, or the MI-4 Ghost Protocol premiere whichever comes first.